Global climate change from anthropogenic greenhouse gas emissions may manifest itself in a number of different ways, from increased desertification to loss of habitat. Many coastal regions, including almost all of Nova Scotia, will be particularly vulnerable to some of the predicted effects of climate change, notably sea-level rise and extreme weather events. A sea-level rise of less than half-a-metre, coupled with a high-tide and a storm surge could severely disrupt the lives of many people living in low-lying communities along much of the Atlantic coast and the Bay of Fundy . At some 19.8 tonnes of carbon dioxide (and carbon dioxide equivalent) per person per year, Nova Scotians are amongst the world's top emitters of greenhouse gases, although slightly below the Canadian average of 20.8 tonnes per person per year . In December 1997, Canada signed the Kyoto Protocol, agreeing to cut its greenhouse gas emissions to 94 percent of 1990 levels by 2008-2012 ; if these targets are to be met, Nova Scotians will be expected to make significant changes in their energy consumption habits. The document, "Powering Nova Scotia's Economy", makes several references to climate change and the greenhouse effect. This report reviews the material on climate change in the document and then discusses ways in which Nova Scotians could decarbonize their economy. "Powering Nova Scotia's Economy" refers to climate change and greenhouse gas emissions in several sections, two of which are reviewed here. The chart is for the years 1979 to 2010 (1979 to 1999 are historical data). The projections (2000 to 2010) show four possible growth curves: average growth, NRCan's projected growth, no growth, and a "6% Energy Reduction". The footnote associated with the 6% Energy Reduction projection states "Targets a 6% reduction from 1990 levels by 2010". Despite its title, the data in the above chart does not refer to primary energy demand. According to the document (page v), Nova Scotia's primary energy demand in 1999 was 269.4 PJ; the chart shows a value below 180 PJ. It is possible that the chart refers to Nova Scotia's end-use energy demand (page v of the document states that end-use demand in 1999 was 179.0 PJ). End-use energy demand refers to energy that is used by a sector where the energy could have undergone a transformation (for example, coal or oil to electricity). Anyone interested in the total greenhouse gas emissions from Nova Scotia should examine primary rather than end-use energy data. The authors have completely misunderstood the meaning of the six percent reduction pledged by Canada at Kyoto. Canada pledged a six percent reduction in emissions not a six percent reduction in energy demand (primary or end-use) . Nova Scotia could maintain its current primary energy demand and reduce its emissions by six percent of 1990 levels through fuel substitution; for example, replacing coal by renewable forms of energy. A six percent drop in emissions does not necessarily translate into a six percent drop in a given fuel. For example, because of Nova Scotia's energy mix and the ratio of carbon dioxide emitted by different fuels, a six percent drop in energy-related emissions would require an 18 percent reduction in coal consumption or an eight percent reduction in oil consumption (based upon 1990 primary energy consumption for Nova Scotia ). Document pages xxxiii and xxxiv are devoted to the problem of global climate change. The authors of the document present a brief summary of the problem and include a discussion of Nova Scotia's role, in light of Canada's committment to cut its greenhouse gas emissions to 94 percent of 1990 levels by 2008-2012 (in other words, a six percent reduction). On page xxxiv, the document states "Nova Scotia's GHG emissions had risen from 19,400 kilotonnes (kt) equivalent of CO2 equivalent to 20,100 kt of CO2 equivalent by 1998. [...] Emissions are estimated to be 21,100 kt of CO2 by 2010. Achieving a 'Kyoto-like' target in the reduction of emissions would require a 16 percent reduction from a business-as-usual forecast." Nova Scotia's 1990 emissions were, as stated in the document, 19,400 kilotonnes of CO2 equivalent . To meet the Kyoto target, a six percent reduction is required; six percent of 19,400 kilotonnes is 19,400 × 0.94, or 18,236 kilotonnes. Assuming that Nova Scotia's projected emissions of 21,100 kilotonnes by the year 2010 are correct, then the percentage decrease in emissions to meet the Kyoto target must be (21,100 - 18,236) / 21,100 or 13.5 percent. The 16 percent emissions reduction is incorrect because it is based upon incorrect information, presumably obtained from Voluntary Planning's "Climate Change Workbook" (issued as part of the Government of Nova Scotia's consultations held with stakeholders in 1999) . Page 7 of the Climate Change Workbook states that in 1990, Nova Scotia's emissions were 19.4 million tonnes of CO2 and that a six percent reduction would give a reduction target of 17.7 million tonnes. As has been shown above, six percent of 19.4 million is 18.2 million, not 17.7 million. Achieving a decarbonized economy will eventually require Nova Scotia to abandon fossil fuels in favour of renewable energy sources such as biomass, solar, wind, and small scale hydro. The document admits to this on page xxviii, where it states: "Alternative energy sources can, in many cases, reduce the environmental impacts associated with energy produced by fossil fuels. The reduction of carbon emissions in particular may have significant impact on future mandatory reductions resulting from the ratification of an international climate change treaty". Despite this admission, the document's main thrust is for the development of oil and natural gas. switching to lower-carbon fossil fuels (e.g., oil to gas). As will be shown in the next section, limited substitution of lower-carbon fuels does not guarantee a significant decline in greenhouse gas emissions if there is no concomitant decline in energy consumption. Furthermore, basing emissions reduction on finite fossil fuels simply postpones the inevitable need to move to renewable energy. Improving energy efficiency is intended to reduce energy demand. This will, in turn, reduce emissions (by how much depends, once again, on the fuel: a reduction in coal will have a greater impact than an equivalent reduction in oil consumption). Improvements in energy efficiency can be achieved through technological change (such as hybrid automobiles) or through social change (such as people abandoning their automobiles in favour of more sustainable modes of transportation). sequestration of carbon in agricultural soils or forests. Sequestration of carbon is a permitted method of emissions reduction under various UNFCCC agreements (for example, see ). There are many concerns about sequestration that must be addressed; for example, carbon dioxide sequestration is greatest while trees are young, once mature, the rate decreases, and as a result, these forests will have to be logged and replanted at regular intervals; the felled trees and their residue cannot be combusted as this will add to the planet's carbon dioxide levels. Also, forests can be destroyed by disease, fire, or storm, all uncontrolled means whereby the sequestered carbon is re-released to the atmosphere. capturing methane from landfills and underground mining. If all landfill methane could be captured in Nova Scotia, it would represent the equivalent of about three percent of the province's total greenhouse gas emissions. Once captured, the methane is usually combusted, creating more carbon dioxide. A long-term strategy of minimizing the amount of organic matter put into landfills may prove to be a better solution. Fugitive methane from underground coal mining has been decreasing significantly over the past decade as provincial coal mines have been closed (1.2 Mt to 0.83 Mt CO2 equivalent between 1990 and 1996 ). This number will probably continue to decrease. Interestingly, a significant source of fugitive methane comes from natural gas production and transportation ; meaning that provincial pipelines may replace coal mining as Nova Scotia's principle source of fugitive methane. storing generated CO2 below ground. The problem with capturing CO2 and storing it below ground is that it takes energy to do both of these activitives. However, because of declining oil stocks, a technique known as Enhanced Oil Recovery captures CO2 and pumps it into "depleted oil fields", thereby extracting additional oil (the energy balance may be negative, but North America's need for oil is such that this is economically attractive). At present, Pan Canadian imports CO2 from North Dakota for its Enhanced Oil Recovery programme at the Weyburn Oilfield . CO2 capture is intended for stationary power plants; CO2 from automobiles is problematic because of the complexities associated with fitting the necessary equipment on every automobile. The purpose of emissions trading is to reduce CO2 emissions by opening it to market forces. Each organization (i.e., country, company, or individual) that is committed to reducing emissions is given a target; organizations will either produce fewer emissions than their target or more. Organizations that produce fewer emissions are awarded 'credits' which can be sold on the open market to other organizations that produce more emissions. The concept works in principle, but requires monitoring agencies to verify that targets have truly been met. Furthermore, the cost of not meeting the required targets must be such that missing a target will become a financial burden on the organization (another reason why many developed countries that are heavily dependent upon fossil fuels are reluctant to join emissions trading schemes). Before considering emission reduction strategies, it is worthwhile examining NRCan's primary energy demand projections for Nova Scotia and the resulting greenhouse gas emissions. Over the next decade in Nova Scotia, NRCan projects that natural gas will come on-stream, displacing oil in the commercial, industrial, and residential sectors as well as for electrical generation. However, natural gas is projected to make little impact on coal consumption (for electrical generation). Primary energy demand is expected to grow from 253.0 PJ in 1990 to 281.2 PJ in 2000 and 285.6 PJ in 2010. If NRCan's projections are correct, the decline in CO2 emissions from energy sources will be gradual, peaking at 18.9 megatonnes in 2000 and holding steady at 18.5 megatonnes for 2005 and 2010. These charts include carbon dioxide from energy sources only, other greenhouse gas emissions from other sources are not included. Emissions from renewable sources of energy, notably biomass, are carbon-neutral (i.e., CO2 released from the burning of biomass will be removed from the atmosphere by new biomass growth). Emissions from refined petroleum products are assumed to be 70 tonnes per terajoule . Emissions from coal are assumed to be 85 tonnes per terajoule . Emissions from natural gas are taken as 49.68 tonnes per terajoule . In the document (and elsewhere), greenhouse gas reduction is portrayed as a monolithic action, applied to the entire economy. This approach is naive, since it fails to recognize that the economy is made of various sectors, each with its own energy requirements. By examining each sector individually, emission reduction strategies can be tailored to the energy requirements of the sector, potentially making it more acceptable to the public at large. Emission reduction strategies for the four sectors of the Nova Scotia economy as well as electrical generation are now considered. 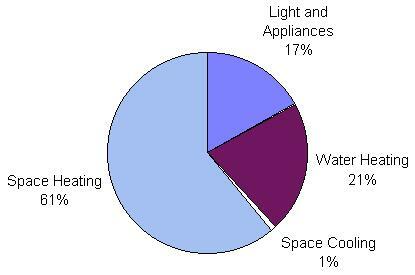 This chart shows that with the exception of electricity for lighting and appliances, the majority of the energy used for residential purposes in Canada is for space and water heating. In Nova Scotia, most thermal power stations are no more than 40 percent efficient, meaning that about 60 percent of the fuel burned in the power station is discarded as 'waste' heat. District heating is the utilization of the so-called 'waste' heat from thermal power stations for space heating and domestic hot water in buildings, including residential. The 'waste' heat is piped as hot water from the power station to residential neighbourhoods, where the pipes are connected to residential heating systems. District heating offers numerous advantages: more efficient use of energy, improved air quality (by reducing the number of furnaces in a neighbourhood), local employment, and choice of fuels (since the hot water is not dependent upon the fuel source). District heating is an extremely efficient use of energy: it replaces two fuel sources (one for electrical generation and the other for space/water heating) with one fuel source (part for electrical generation and the 'waste' part for space/water heating). In fact, district heating is an example of how 'saving the environment' actually 'saves money', since less fuel is consumed to perform two tasks. At present, only cities and towns that are near existing thermal power stations can realistically take advantage of district heating systems. However, in those cities and towns that are not located near a thermal power station, smaller 'combined heat and power' (or CHP) plants can be built to generate electricity and heating water. The source of energy for CHP plants can be existing fossil fuels or other fuel sources, such as biomass . 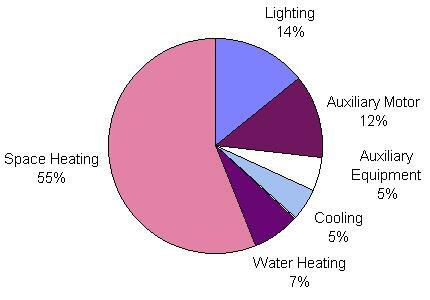 Passive or active solar technology. Most buildings in Nova Scotia are not designed for solar gain, either passive or active. By constructing new residential buildings to maximize their solar gain, space heating requirements for these buildings would be reduced. Residential space heating requirements can be reduced even further by improving the building insulation. As with residential energy use, significant energy reduction could be achieved by meeting space and water heating requirements (currently satisfied by electricity and oil) with district heating, passive and active solar, and improved insulation. Nova Scotia's industrial energy demands have averaged about 50 PJ per year (NRCan predicts this trend to continue to at least 2010). In 1997, Nova Scotia's industrial energy demand was 50.8 PJ, primarily from electricity (10 PJ), oil (26.9 PJ), and pulp spenting and wood waste (10.1 PJ) . Over the past decade, significant improvements in energy usage have taken place in much of Canada's industrial sector, to keep costs down and remain competitive with foreign companies . The industrial sector is a twist on 'helping the environment' and 'saving money'; in this case, by keeping Nova Scotia's industrial sector competitive through improvements in energy efficiency (i.e., 'saving money'), it is possible to help the environment. loss of compact urban form and growth of low-density housing. loss of communities to low-density housing which results in loss of social interaction. Ground-level ozone, formed from the reaction of nitrogen oxides, oxygen, VOC (volatile organic compounds), and sunlight, are known to cause a wide range of health effects, include eye, nose, and throat irritation, chest discomfort, coughs, and headaches. Some studies suggest that there is a link between ozone and childhood asthma and some cancers. rising energy costs increase the price of imported foods. increased distances traveled lead to increased emissions. rising cost of road construction and maintenance. loss of 'quality' time with families. Although transportation is central to our 'lifestyle', it is widely acknowledged that continued growth in auto-centric transportation is unsustainable . With this in mind, it is time to re-think how people and goods are transported in Nova Scotia. By reducing our dependence on the automobile, energy demand can be reduced with an associated fall in greenhouse gas emissions. Technological change, such as the introduction of novel fuels, may well reduce greenhouse gas emissions, but the problems associated with the automobile (some of which are listed above) will remain. Nova Scotia required 99.6 PJ of fuel for electrical generation in 1997: coal (86 PJ), oil (10.1 PJ), and hydro-electric (3.5 PJ) . The end-use demand for electricity amounted to 33.6 PJ from the following sectors: residential (13.2 PJ), commercial (10.4), and industrial (10 PJ). The difference between the fuel required for generation (99.6 PJ) and the electricity consumed (33.6 PJ) is 66 PJ; one or two PJs were used within the generating stations. The remainder, about 64 PJ, was discarded as 'waste' heat (actually thermal pollution) from thermal power stations to the environment. In addition to district heating, another way in which greenhouse gas emissions can be reduced is to replace existing thermal power stations (i.e., coal and oil-fired) with renewable energy sources, including some of those suggested in the document (page xxvi): biomass, solar, wind, and small-scale hydro. All of these technologies are 'mature' in that they have proven track records around the world. Furthermore, Nova Scotia has excellent potential for many of these technologies; for example, the off-shore wind regime has the potential to supply up to ten times Nova Scotia's current electrical energy needs . The development of renewable energy in Nova Scotia is being hampered, in part, by Nova Scotia Power's pricing arrangements, which discriminate against independent power producers. Other jurisdictions encourage independent power producers by requiring utilities to 'wheel' power across their grid. Another approach which is gaining widespread acceptance in the United States is the introduction of 'Renewable Portfolio Standards' (RPS), in which utilities are required by law to include renewable energy in their energy mix. RPS is different from existing 'green power' schemes in that the utility cannot charge a differential fee for renewable energy. Most RPS schemes require their utilities to supply a small percentage of their power as renewables; this percentage increases each year until it reaches a maximum, which must be maintained by the utility (for example, see ). The cost of home heating fuel is rising and affecting many Nova Scotians on fixed income. The cost of gasoline is rising and affecting Nova Scotian motorists and the cost of shipping goods to and from Nova Scotia. The most obvious way of solving this problem is to decarbonize Nova Scotia's economy. If Nova Scotians were to reduce their consumption of fossil-fuels using the measures outlined in this report, not only would they be 'saving money' (by using energy more efficiently), they would also be 'saving the environment'. foster the growth of a renewable energy industry in Nova Scotia by adopting a Renewable Portfolio Standard. require all existing thermal stations (coal and oil) to convert to combined heat and power. offer low-cost loans to communities that wish to take advantage of combined heat and power. institute a provincial transportation scheme, consisting of community buses (operating in rural communities), regional buses (connecting rural communities to regional centres), and intercity buses and trains (connecting regional centres). remove all tractor-trailers from provincial highways and put the goods they presently carry on the railway; local distribution can be handled by local trucking firms. reimplement the energy efficiency projects and programmes formerly operated by the provincial government. introduce zoning laws that would require all new buildings to maximize their reliance on solar energy. require the Auditor General to present an annual report on the province's progress towards a sustainable energy future. By developing a policy such as the one described above, Nova Scotians will become leaders in the field of sustainable energy, gaining knowledge and expertise that could be shared with the world. And, by the way, will reduce their greenhouse gas emissions. The author would like to thank Andy George, Vanessa Kind, and Dr. Tim Little for their assistance with this report. Shaw, J., R.B. Taylor, D.L. Forbes., M.-H. Ruz, and S. Solomon, Sensitivity of the Coasts of Canada to Sea-level Rise, Geological Survey of Canada Bulletin 505, 1998. Jaques, A.P., F. Neitzert, and P. Boileau, Trends in Canada's Greenhouse Gas Emissions 1990-1995, Environment Canada, 1997. United Nations, Report of the Conference of the Parties on its Third Session, Held at Kyoto from 1 to 11 December 1997, FCCC/CP/1997/Add.1, March 1998. Natural Resources Canada, National Energy and Emissions Results: Annex C, 2000. Neitzert, F., K. Olsen, and P. Collars, Canada's Greenhouse Gas Inventory - 1997 Emissions and Removals with Trends, Greenhouse Gas Division, Pollution Data Branch, Environment Canada, April 1999. Voluntary Planning, Turning Challenge into Opportunity - A Climate Change Workbook, Halifax, Nova Scotia, 1999. United Nations, United Nations Framework Convention on Climate Change, 1992. Marks, G. personal communication, 2001. NRCan, Canada's Energy Outlook 1996-2020, Energy Forecasting Division, Energy Policy Branch, Energy Sector, Natural Resources Canada, 1997. Hughes, L. and S. Scott, A Clean Energy Policy for Nova Scotia, IEE Clean Power 2001, London, England, November 1993. Halifax Regional Municipality, Interim Regional Transportation Strategy, December 1999. Hughes, L., An Alternative to Natural Gas Distribution in Halifax Presented to Nova Scotia Utility and Review Board, Public Hearings on the distribution of Sable natural gas in Nova Scotia, May 1999. Davies, S., Offshore Wind Energy in Nova Scotia: A Feasibility Study, Department of Electrical and Computer Engineering, Dalhousie University, Senior Year Project, December 2000, (supervisor: Dr. Larry Hughes). Real de Azua, C., Texas - Leading the US wind power surge, Renewable Energy World, vol. 4, no. 1, pp. 30-39, Jan-Feb 2001. British Petroleum, BP Statistical Review of World Energy, 2000.